After all their generosity to me over the past few years, this year I decided to do something extra special for my folks for their Christmas gift: new lighting fixtures. 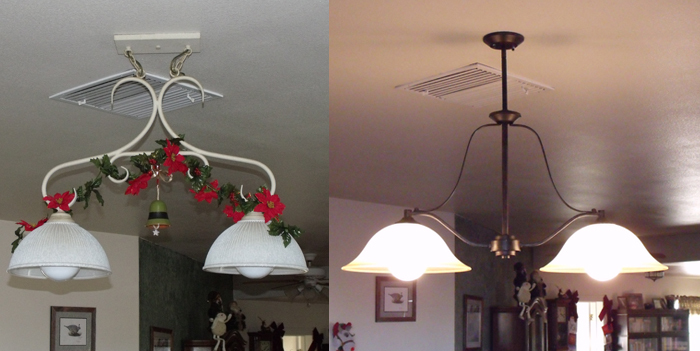 My mom has continuously complained about the lighting fixtures in her kitchen and dining area. Apart from wanting to get away from the too-country style (wheat sheaves on the chandelier? ), she wanted fixtures that matched each other and would be easier to keep clean. Seemed like a piece of cake. However, I still hesitated. After all, choosing someone else’s lighting fixtures can be a tricky business. What if the color’s wrong? What about the size? What if they don’t like the style as much as I thought they would? After much hand-wringing, though, I finally decided to go for it. Figuring the simple, clean lines and deep finish would suit my folks’ decor and cleaning requirements, I went with the Kichler Lighting Langford Downlight Chandelier for over the dining table and the Langford Island Light for over the cooktop, both in Canyon Slate with Dusty Citrine Glass shades. After ordering them, the fixtures were delivered to me fairly quickly. Then the adventure really began. While not terribly heavy, the careful packaging did make them somewhat bulky. As such, fitting them into my petite Cabrio was a bit humorous. It was even more so fitting them in with two cats, piles of other presents, my luggage and myself. But, after some strategizing, sweating and swearing, I made it work. 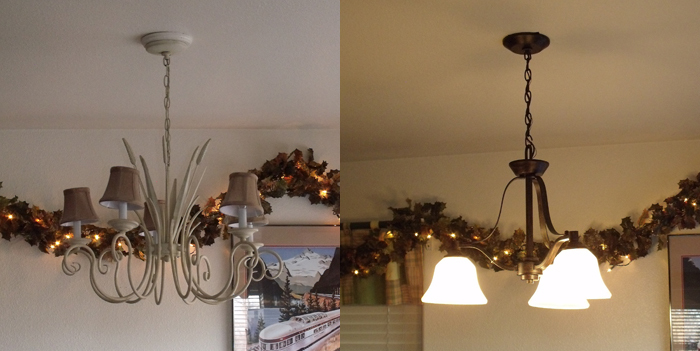 The before and after of Mom's dining room chandelier, much improved by the Langford Downlight Chandelier by Kichler. My mom was tickled and anxious for us to get the Island Light up before I had to head home the next day. Over the island countertop, installation would be trickier. Careful to remain balanced on the supported portion of the counter near the hob cooktop, I was able to get the old fixture down easily. Having already gotten the wiring figured out with the chandelier the previous day, it seemed that installation of the new island light would actually go quicker. And it might have, if not for our Screw Situation. The before and after, now featuring the Langford Island Light by Kichler to match the dining room fixture. Minor dilemmas aside, the final result is a vast improvement over the previous off-white, dirty, wheat-decorated fixtures. My folks are happy, so I’m very happy. And I’m glad to have finally put my money where my mouth is and–instead of just writing about how a fixture looks–go through the actual installation process of a couple of them. I feel much wiser, indeed. You can find these dining room ceiling lights from Kichler at Lumens.com. What color does the canyon slate look like in person? Do you think it would go with other bronze fixtures?